In a pressure blast system - see BNP 65 illustrated below - a “pressure pot” much like the propane gas bottle on a gas barbeque grill with a pop-up valve on the top is depressurized by releasing the pop-up valve, automatically or manually filled with abrasive, pop-up valve reseals and the tank is repressurized with compressed air. In operation the contents of the pressure pot with abrasive mixed with the compressed air flows out through a single hose about the size of a fire hose to the nozzle. When air / abrasive mix is exhausted, pressure pot pop-up valve opens, abrasive replenished, valve seals, pot is repressurized with air and blasting commences again. Suction blast equipment is less expensive to build and acquire and more appropriate for most blast cleaning, surface texturing and peening applications. Pressure systems deliver the abrasive with much greater force akin to watering your garden with a fire hose and hence lend themselves to rust removal, de-painting and cleaning larger areas such as ship hulls, large parts or where the greater force and larger volume of abrasive are desired. Standard machines range from 1/2 to 160 cubic feet. 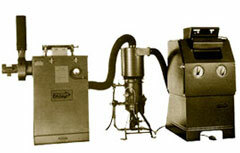 Hoppers are available to increase capacity, or ask about custom orders for larger blast machines. For a chart displaying Air Requirements and Abrasive Consumption, click here.